The American concept of personal freedom takes a back seat in West Virginia and other states that do not protect their citizens’ ability to get some jobs without being forced to join or pay fees to a labor union. For state governments or the federal government to allow such conditions for going to work to exist is as antithetical to the idea of individual freedom that our nation was built on as it gets. Half of the 50 states have already embraced worker freedom and passed right-to-work laws. These laws have a positive impact on the economies and job picture for those states, and are creating jobs. And now West Virginia is poised to become the 26th state where workers are free to choose whether or not to join a union. 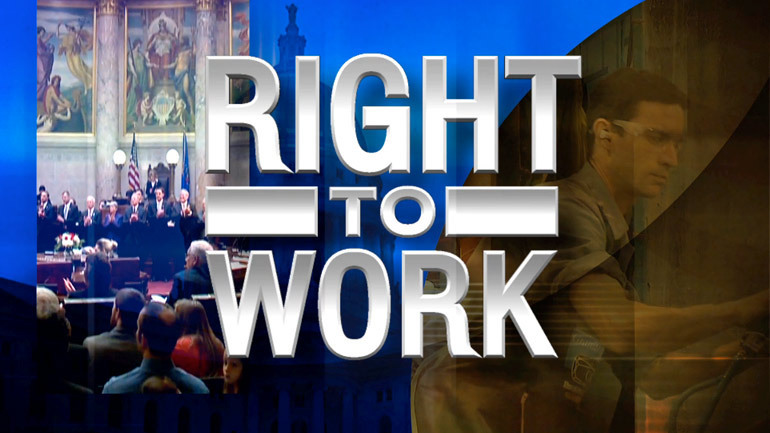 The state House of Delegates and Senate have both passed right-to-work legislation. The Mountain State’s Democrat Governor Earl Ray Tomblin, has vowed to veto the bill, but the Republican majorities in both houses can override that veto. Advocates of right-to-work in the state legislature say they are not opposed to unions, per se, but do oppose state laws dictating that unions receive taxpayer and worker funds. West Virginia and 25 other states believe that people should be free of pressure to join a union to get a job and believe that such mechanisms are deterrents to business development and job creation, and thus are harmful to the economy of states. Characterized as pro-worker, pro-growth, pro-freedom and pro-job, abolishing forced unionization and the prevailing wage rule in the state are predicted to improve the state’s business climate, increase job opportunities for West Virginians, and help overcome the economic damage to the state’s economy brought on by the Obama administration’s war on coal. The rub arises when a union has negotiated a contract for workers in a business, and some workers do not want to join the union. The union argues that it isn’t fair for non-union workers to benefit from union negotiations, and the union is correct about that. So then non-union workers are assessed a fee to compensate the union for their benefits. But then that isn’t exactly fair, either, as non-union workers have nothing to say about how the union uses their money. The solution is simple: Those workers who want to join the union should be able to do so, and to benefit from the union negotiated work conditions and wages, and those who choose not to join should not be required either to join, or to pay money to the union, and therefore would negotiate their own deal with the employer. Labor unions evolved from workers wanting better conditions, having endured conditions that were generally unfair and even dangerous for many years. Over the years after workers became organized, however, federal and state governments put laws and rules into effect that provided protections for workers, taking on the primary role that labor organizations had been providing. With their prime function now essentially covered by laws and regulations, labor unions had to change their focus in order to survive. They have become active and influential political organizations, using member dues and non-union worker fees for political purposes. And too often, the demands they make to attract membership frequently involve things that no sensible business would do on its own, such as demanding work rules that are inefficient and designed to increase union jobs, rather than increase efficiency and productivity. They often demand pay practices that ignore individual worker performance, basing pay on considerations other than the worker’s abilities. And they routinely protect the job of all members regardless of their performance, or the health of the business. Despite their actions on behalf of their members, which frequently are harmful to the businesses in which their members work, union membership has declined sharply from its peak in the mid-1950s, when one in three workers belonged to a union. The decline began to accelerate in 1980, according to Economy Watch online, and today union membership is a mere 11.1 percent. That figure includes public-sector workers, who among all workers have the least justification for union representation, given that their employers are the governments that enforce labor law. Public workers are 5 times more likely to belong to a union than their private-sector counterparts, with a union membership rate of 35.2 percent, while the private employee rate is just 6.7 percent. Many of the demands of unions on businesses, while good for union members, make profitability more difficult for businesses, artificially raising wages and labor costs, thereby increasing the price of goods and services for everyone, including union families. Rather than being an adversary of management, unions could become partners, focusing on providing a better trained and more productive workforce, assisting business in succeeding, and creating jobs through natural economic methods, rather than blackmailing employers into actions that benefit only one side of the labor/management equation. Under this scenario unions could succeed on their own merits rather than depending upon government force and political intrigue for their survival.